Two weeks ago we had my sister's older two kids stay with us. I had 5 kids ages 7 and under for five days during a really hot week. Playing outside at the park was out of the question and I was having a beast of a time peeling them away from tablets and the tv. One afternoon I decided to take them to McDonald's for lunch. They could eat and then play to their hearts' content in the Play Place. 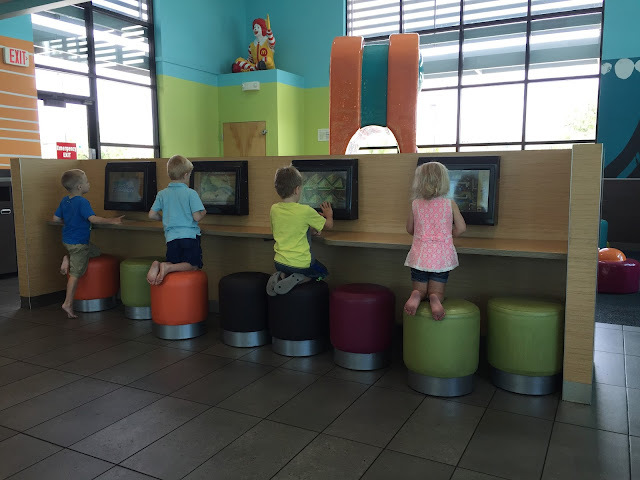 Apparently the McDonald's near our house has a tiny play area meant for ages 0-3 and computers for the older kids. I'm a bit torn on this. On the one hand, I understand that there are probably children in our area who don't have regular access to a computer and it's great that they have a chance to go to McDonald's and improve their computer literacy and play fun games. On the other hand, I overheard 3 other moms while I was there complaining about the same thing I was: I did not bring my kids to McDonald's to have MORE SCREEN TIME. How do you feel about the computers at some McDonald's locations? I talked to my neighbor about it and she said there's another location several miles further that does NOT have computers, but it means 10 minutes more drive time. Is it worth driving further to AVOID the computers? That feels silly but...maybe? Good for you seeing the positive. I was just super annoyed about this when I saw it. Remember the big germy play center and tunnels? Ugh! We are dying in the heat and ready for more outside play too. Kids who do not have access to tablets at home... But I take my kids to the grocery store or the mall so they can learn to be patient and wait and all of the social nuances that come with those activities (greeting the cashier, listening to mom, bagging the veggies), NOT so they can zombie their way through it! Too much!! This is just the worse! Ugh. Not that I want to deny the children access to computers that don't usually have it, but isn't that what the library is for? Public computers, free of charge? Spending so much time with my bonus kids last week I am shocked and appalled at how obsessed they are with phones/iPad/TV, often times ALL THREE AT THE SAME TIME. Gaaaaaah! What happened to childhood!? Seriously? Computers at McDonalds? I'm am terrified of raising my kids in a technology filled world. It seems impossible to avoid, but I'm afraid that kids his age won't even know how to socialize with other kids.